If you are passionate about fats, oils, lipids, or surfactants then you belong here! AOCS members lead the way in the research and development of innovative products and solutions that involve fats and oils. Our welcoming Society embraces new members and offers a supportive network enabling connections, collaborations, and discoveries. Join today for 2018 and immediately become a member for the rest of 2017 free! How will you advance with AOCS membership? New in 2018! Members will have FREE online access to all AOCS journals. Read, download and cite information spotlighting research and reviews in current and archived issues of: Journal of the American Oil Chemists Society (JAOCS), Lipids and Journal of Surfactants and Detergents (JSD). AOCS Premium Content Library on inform|connect. You will have access to exclusive member-only content including journal articles, book chapters and presentations from AOCS meetings. Discounts on meeting registrations. AOCS members benefit from savings on registration rates at AOCS meetings. Meet with peers to exchange best practices and share your work. Print and digital versions of INFORM magazine. This AOCS resource provides you with the latest updates in scientific advances, trends and topics. Receive 30% savings on AOCS Press and Academic Press titles and Elsevier books covering a broad range of topics. Save US $375 on the fully revised Official Methods and Recommended Practices of the AOCS, 7th Edition. 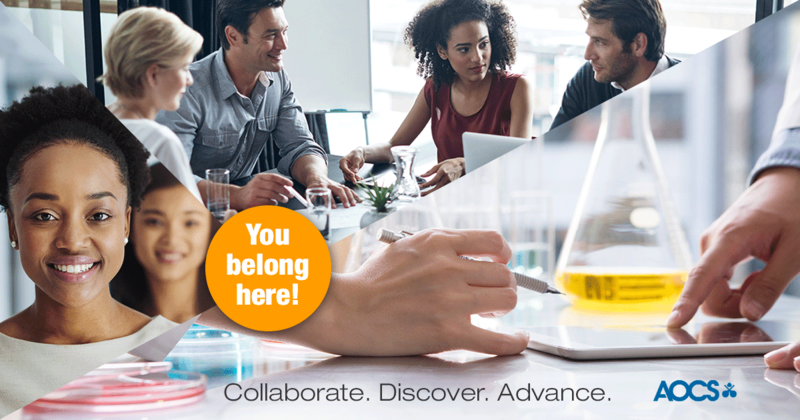 Collaborate, discover and advance with AOCS membership.